Our product range includes a wide range of solid sponge tyre. 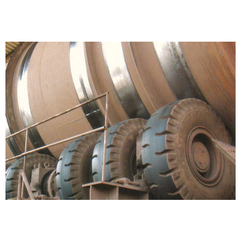 We are involved in offering high-quality Solid Sponge Tyre to our valuable customers and used in Metallurgical, mining and construction equipment, like mixing drums in the sintering plant. The products offered by us are manufactured with the progressive technology and quality approved raw material keeping in minds the industry laid standards. In addition to this, the offered range of products consisting of bias tyre (cover tyre), sponge rubber (center filler) and wheel. Why you choose sponge solid tyre? What is the application of sponge solid tyre? Looking for Solid Sponge Tyre ?